Henderson’s Greater Vancouver City Directory, 1914, Part 2, page 1152. I added a new page on Sir Charles Pigott Piers. He was an author, commission agent, soldier and the 9th Baronet Piers of Tristernagh Abbey. He lived in Englesea Lodge, at 2046 Beach Avenue, from 1914 to 1916. Henderson’s BC Gazetteer and Directory, 1902, page 788. I added a new page on William Henry Wilson. He was a bookkeeper for the wholesale grocery firm of Kelly, Douglas and Company. Henderson’s BC Gazetteer and Directory, 1901, page 767. I added a new page on “C. W. Robinson,” a grocer who lived at 1841 Barclay Street in 1901. It appears that this is actually a reference to Charles William Robson (1853-1906), who lived on the 1800 block of Barclay Street from 1897 to 1902. I also updated the page on Charles William Robson (1853-1906), including references to his grocery and commission merchant businesses. Vancouver Daily World, January 18, 1897, page 8, column 4. Henderson’s City of Vancouver Directory, 1906, page 480. I updated the page on Clarence Mawson Marpole, who was a coal and commission merchant. He lived at 1050 Gilford Street from 1906 to 1912. I added information on his parents, his siblings, and his children. 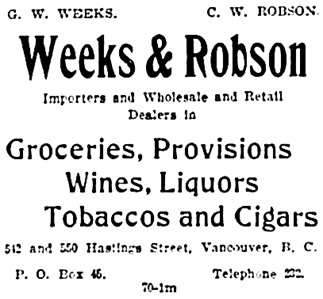 Henderson’s Greater Vancouver Directory, 1912, Part 2, page 1014 [edited image]. Henderson’s City of Vancouver and North Vancouver Directory, 1909, page 1097 [edited image]. I added a new page on James Bain Thomson, who was a dry goods merchant. He lived at 1869 Pendrell Street from 1909 to 1916. Captain J. S. Tait; 1911, 6th Regiment Duke of Connaught’s Own Riles Officers – Officers – [detail]; Vancouver City Archives; VLP 76.8; http://searcharchives.vancouver.ca/6th-regiment-duke-of-connaughts-own-riles-officers-officers-1911. Henderson’s City of Vancouver Directory, 1905, page 446. I added a new page on John Spottiswood Tait. He was the manager of Crawford and Stuart, a firm that supplied fishing nets, rope and twine, oil clothing and rubber boots. He lived at 1932 Alberni Street in 1904 and 1905.